DIY Last Minute Gift Idea! Christmas is this Friday!! 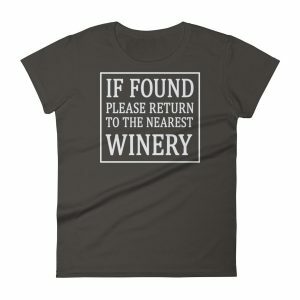 (spoiler alert) I am here to show you a last minute gift idea — whether it be something you add on to a gift (may I suggest a nice bottle of wine) or to give as a stocking stuffer. You probably have all of the items already or can at least make something work that you have on hand. I am trying to save you a trip to the store because people are getting crazy out there! Read on to see how to make this darling snowflake ornament. First things first. This is a cork craft. I know you have them, so if you’ve been saving them in a vase or in something you purchased at Bed Bath and Beyond or even just a zippered bag, gather them up. 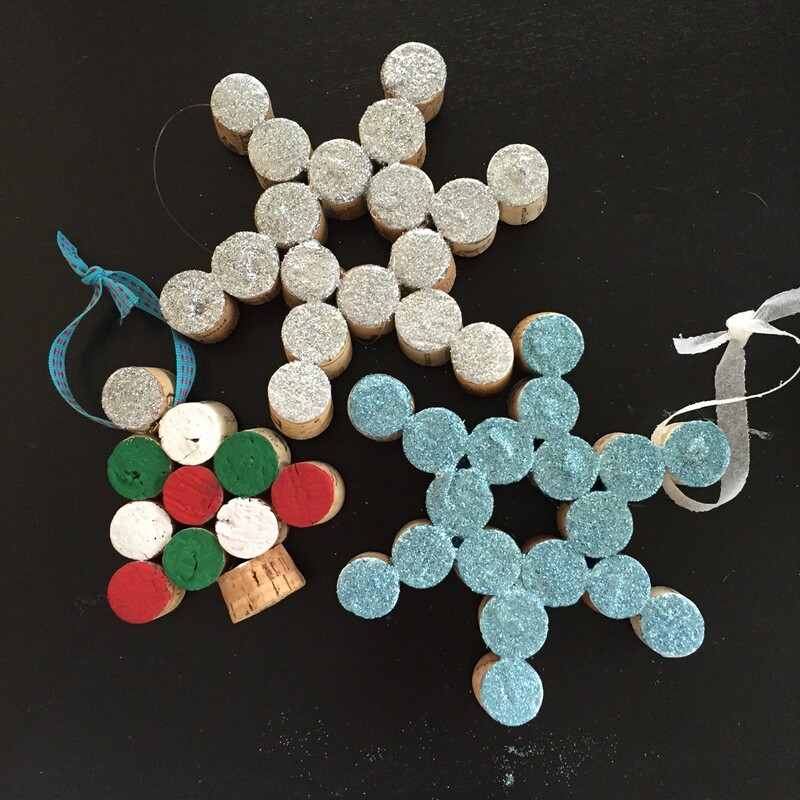 I’m here to show you how easy it is to make a snowflake out of corks! Step 1: You’ve gathered your corks. Now it’s time to cut them in half (making 2 short corks). You can search on Pinterest and see that people recommend steaming them and then cutting. Others use tools you would find in your Grandpa’s workshop. I however, asked my mom if she had a knife I could use. 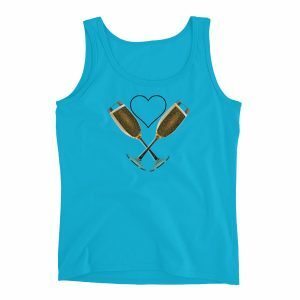 We found one that could cut the corks in half and make them still look like corks when cut. I wish I could tell you the best method to do this, but I’m going to be honest, try and see what works for you. I don’t want you to try something I am highly suggesting, then you go to do it on your own and you end up with a #PinterestFail. You will, however, want to cut them in half. I tried to make one without cutting the corks in half and there is just something about the shorter corks. 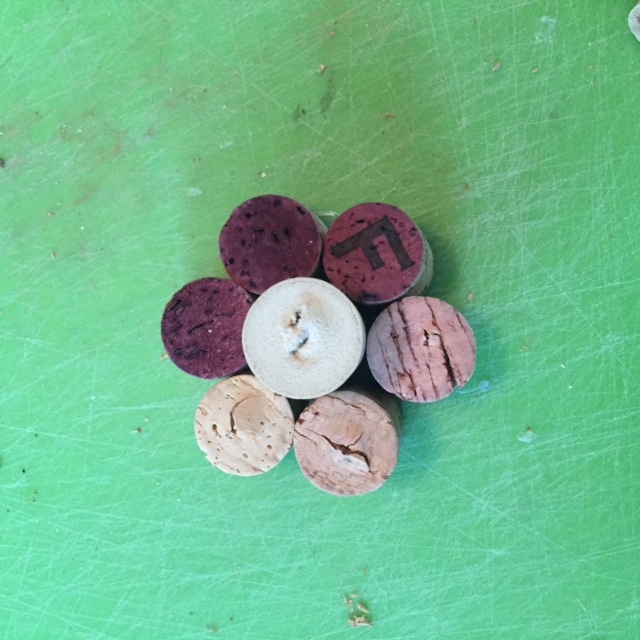 Step 2: After you have cut your corks in half, the best way yo make a circle for the center of your snowflake is to use another whole cork. Circle your half corks around it to make sure the different sizes work in harmony together. Next you just hot glue them together. Use the whole cork as a guide and don’t accidentally glue the cork in the middle to the other ones. 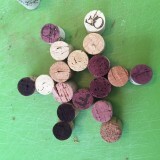 Step 3: Next up is to add the corks around the circle to make it look like a snowflake. 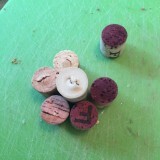 Place two corks in a row in the gap between each of the corks on the circle. 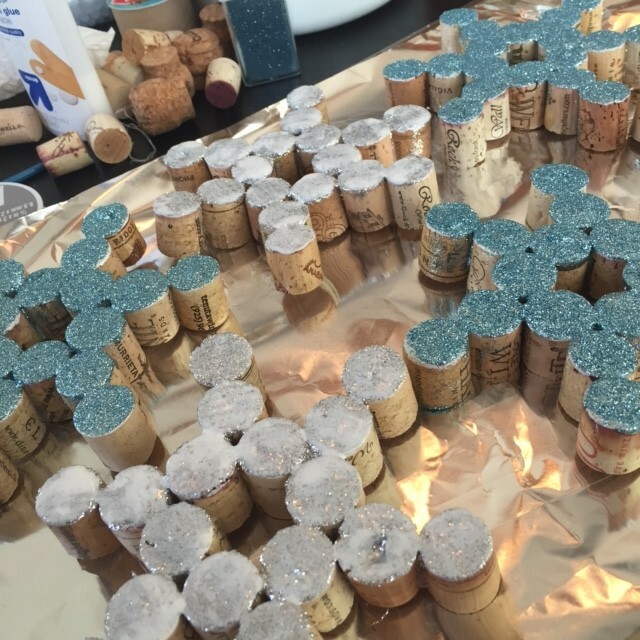 It is best to lay it out before you hot glue so you can get an idea of how you want it to look and what corks look best together because they do vary in size. Step 4: This is the best step! Now you can decorate your snowflake! I opted for glitter because of the shine it will have against the Christmas lights. I used regular school glue to dump the glitter on and then let it dry overnight. 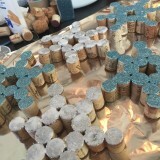 The next night I used a small paint brush to apply Mod Podge to keep the glitter on the corks and not on the floor. A word of caution: I first used a black foam brush to apply the Mod Podge. It went on super thick (it dried clear of course), but I took off some of the glitter when applied. This is why I recommend waiting overnight and then using a smaller brush and being light with the Mod Podge. If you have any tips for this sort of thing, please comment because I would love to hear them! I am just your average girl who enjoys crafting and I am by no means an expert crafter. Step 5: Tie ribbon or fishing line to hang the snowflake on the tree. I’m loving the fishing line look these days! I also made full and half cork Christmas trees using paint to decorate. A couple of notes on this project as well. First, the stump is part of a champagne cork. Second, I used glitter at the top and acrylic craft paint on the tree. Last year I cut out circles of different printed papers (I purchased a small book of paper from Michael’s — don’t forget your coupon!) 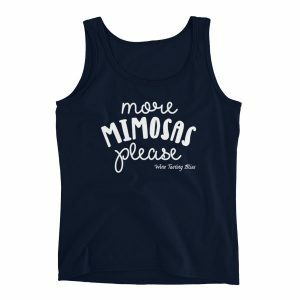 and put sequins at the top. I loved this look a lot more because the paper gave it different dimensions. There are so many ways you can decorate the trees and snowflakes, that I hope you can share yours with me. I love seeing what other people do!! I’m always looking for a new cork ornament idea, so feel free to share what you have made or received this year! 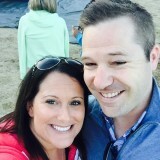 Previous Post:What is Ice Wine?